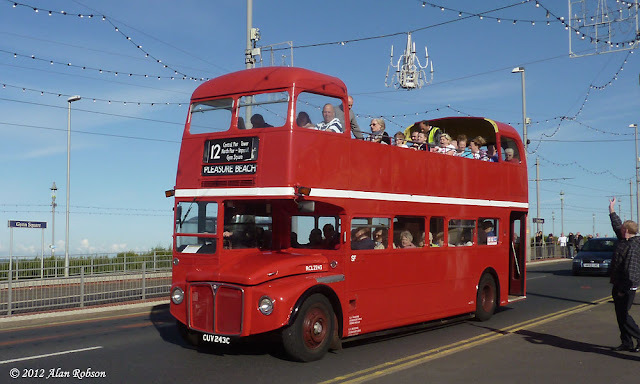 The open top Routemaster on loan to Classic Bus North West from Routemaster Buses at Crewe has become a firm favourite with members of the public on the Sea Front 12 promenade service. 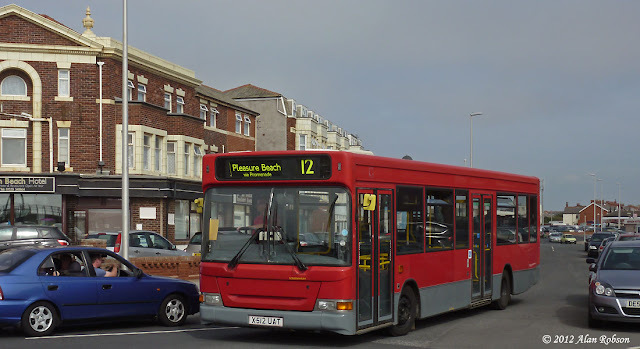 RCL 2243 seems to attract more passengers than any other bus on the sea front route, especially on sunny days. 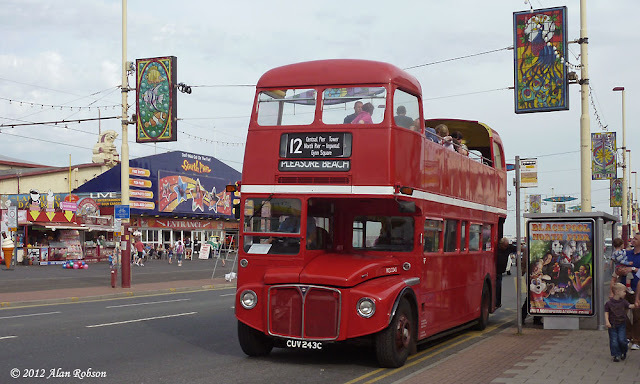 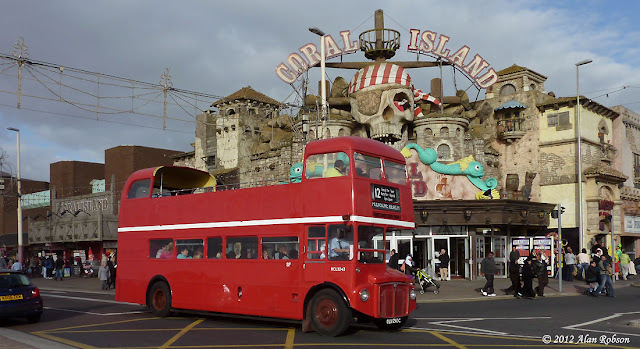 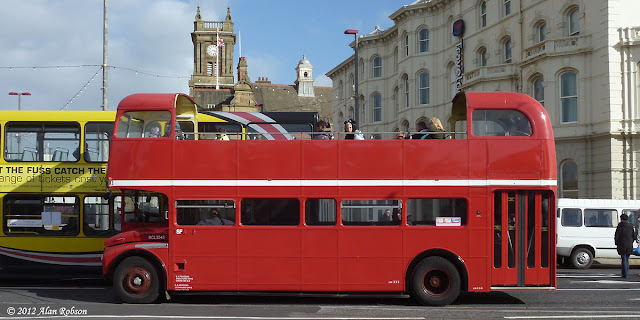 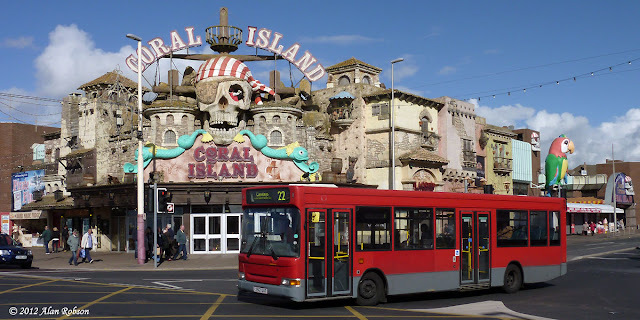 The normal Routemasters of CBNW are already popular with visitors to Blackpool, but RCL 2243 has the attraction of being a London bus with the added opportunity of a ride in the fresh air being thrown in for good measure. 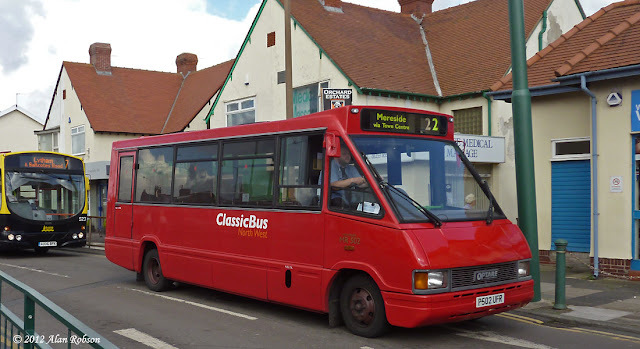 The new Classic Bus North West Catch 22 service, that runs from Mereside to Cleveleys, now has its own dedicated website http://www.catch22bus.co.uk/. 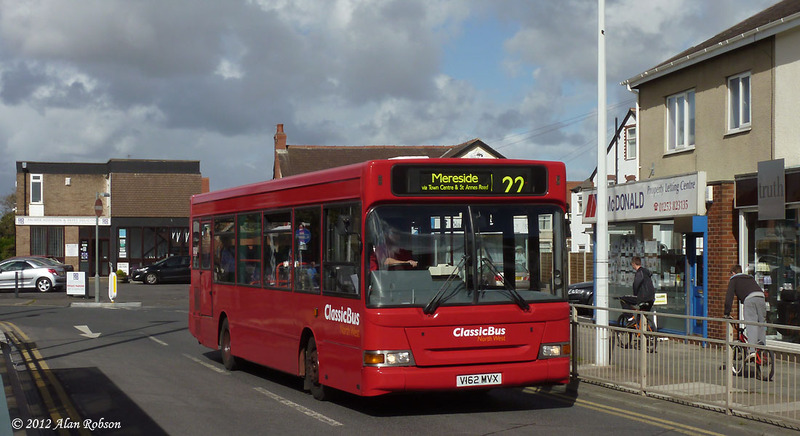 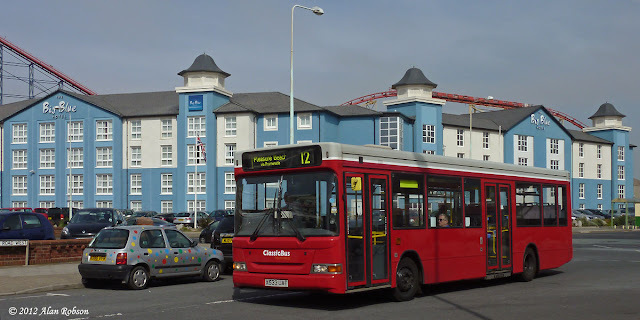 The website has links to a map, fares and timetable for the new 22 service, plus information on CBNW's other operations, ie the Sea Front 12 service and college services 72 and 73. 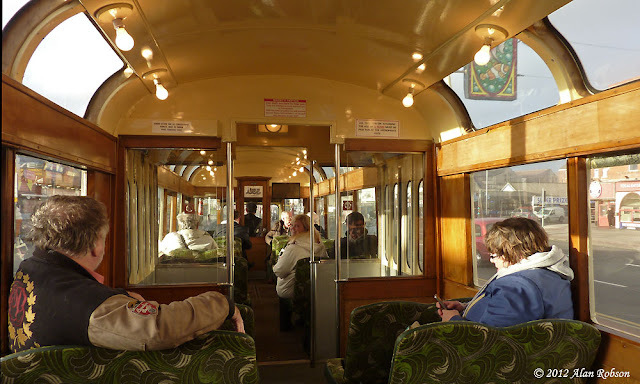 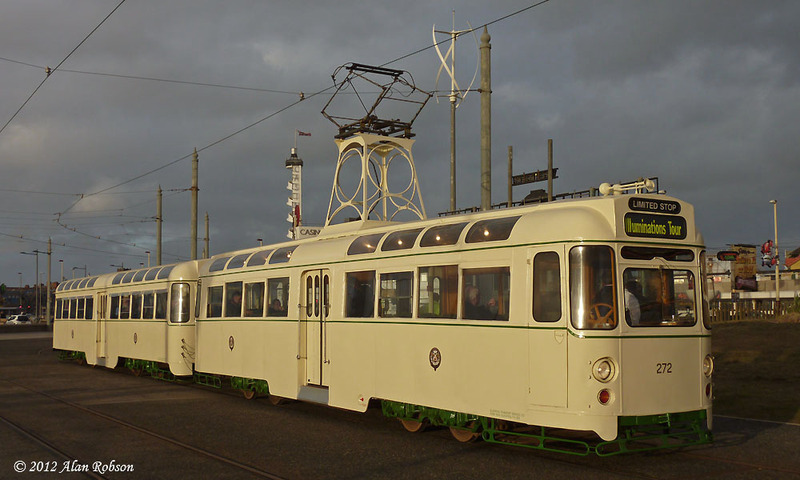 Heritage Brush car 631 was noted out with 'L' plates on today, and Balloon 717 was also spotted out on the tramway undertaking crew training. 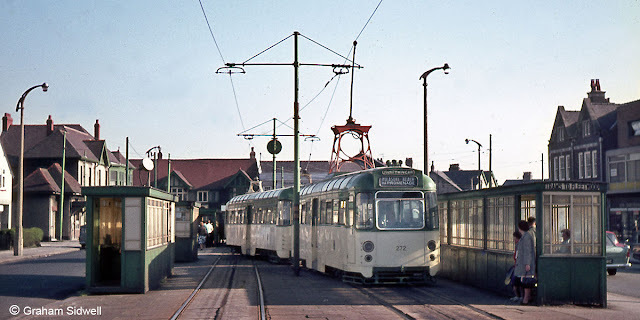 Further to the unveiling of Twin Set 272/T2 just over a week ago, here is a view of the set reversing at Cleveleys on 29th May 1966 (photo courtesy of Graham Sidwell, Editor of Tramfare magazine). 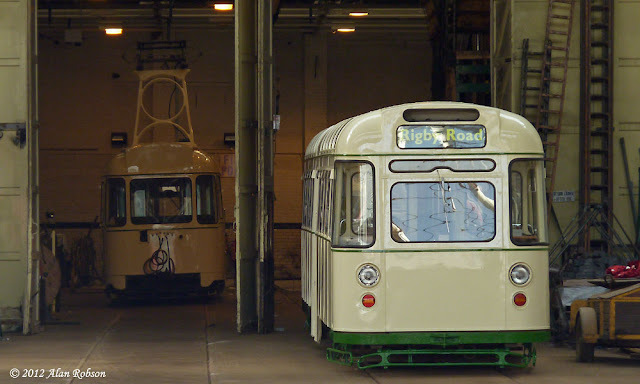 The recent removal of the LTT's collection of trams from Rigby Road depot saw them moved into an open storage yard on the site of the former Duple coach factory at Burton Road in Marton. When the trams first moved to Marton there were only a small number of other vehicles stored on the site, however the last week has seen a fleet of vehicles from Gerry Cottle's Circus arrive, after their 2012 comeback tour to celebrate 50 years in the business. It is to be hoped that the influx of vehicles in the yard doesn't impede access for low loaders which will be needed to move the trams at some point in the future, especially Coronation 304's imminent departure to Beamish. Following the shunt of Twin Set 672/682 last Thursday, that revealed it to be painted in an all cream livery, the trams were officially unveiled at the Pleasure Beach today. 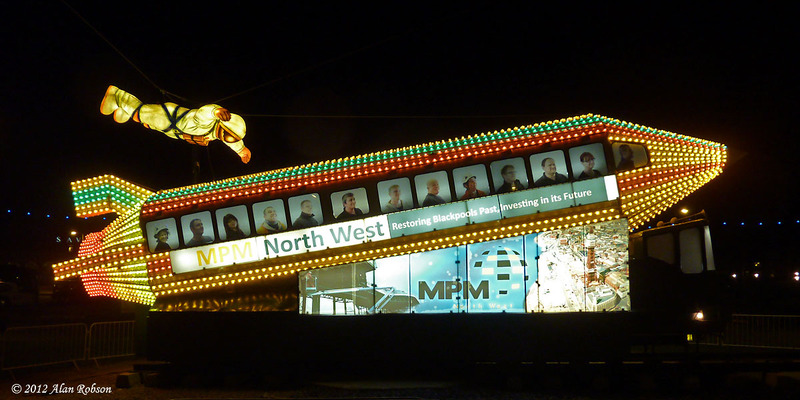 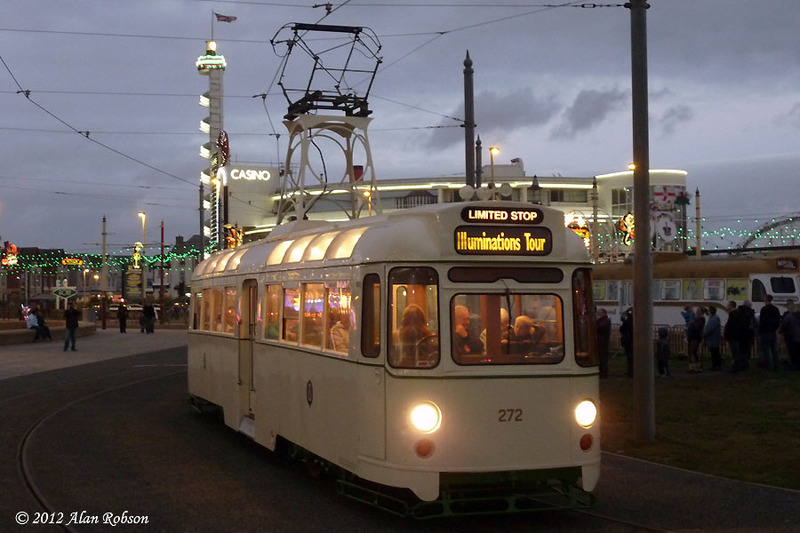 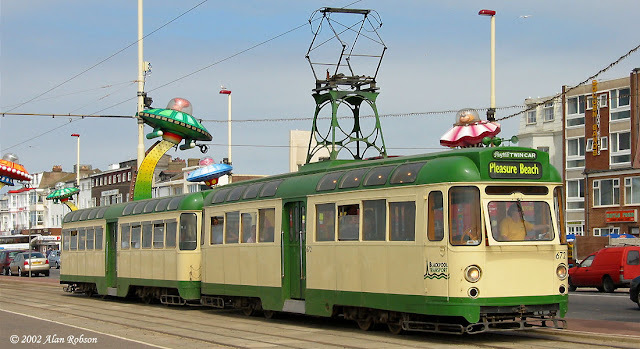 Blackpool Transport had kindly planned to run an early tour, at 18:00 from the Pleasure Beach, so that the tram could be seen and photographed in daylight before it entered Illumination Tour service later that same evening in the dark. 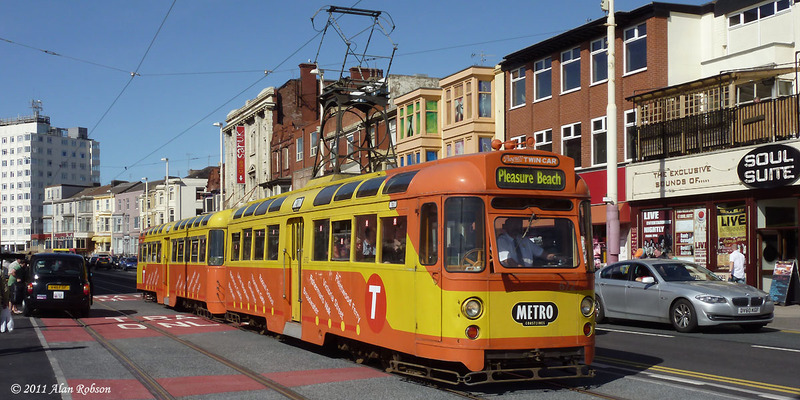 As it happened, technical problems conspired to delay the launch until 18:30, as the tram had to travel to Little Bispham first in order to turn around. 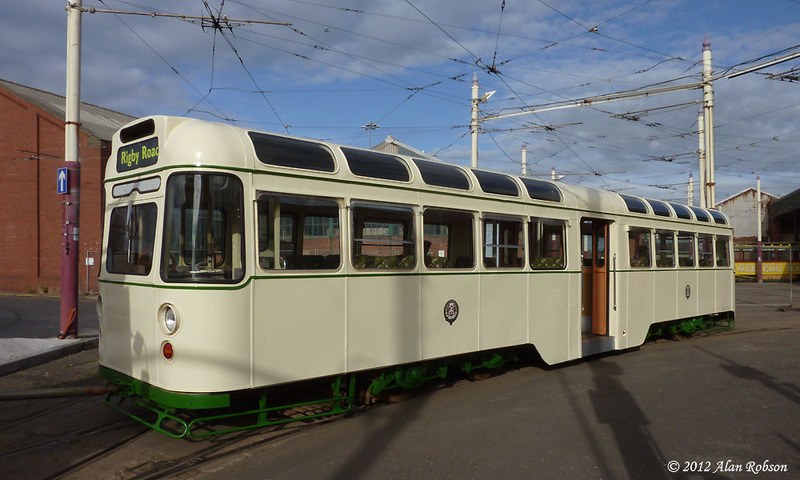 Councillor Fred Jackson performed the unveiling ceremony, revealing that motor car 672 had been renumbered to 272, and trailer 682 to its original fleet number of T2. 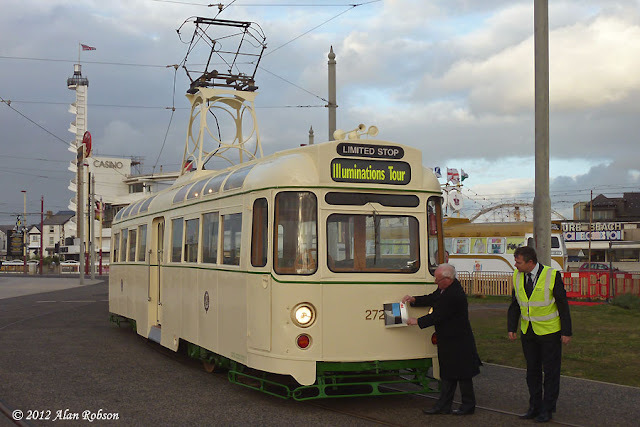 After a pause for photographs, the assembled enthusiasts climbed on board the trailer set to sample its first run as part of the heritage fleet. 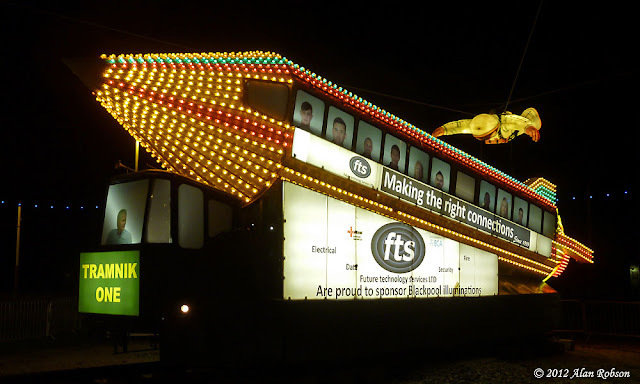 After the launch run, 272/T2 entered normal Illumination Tour duty at the switch on time of 19:45. 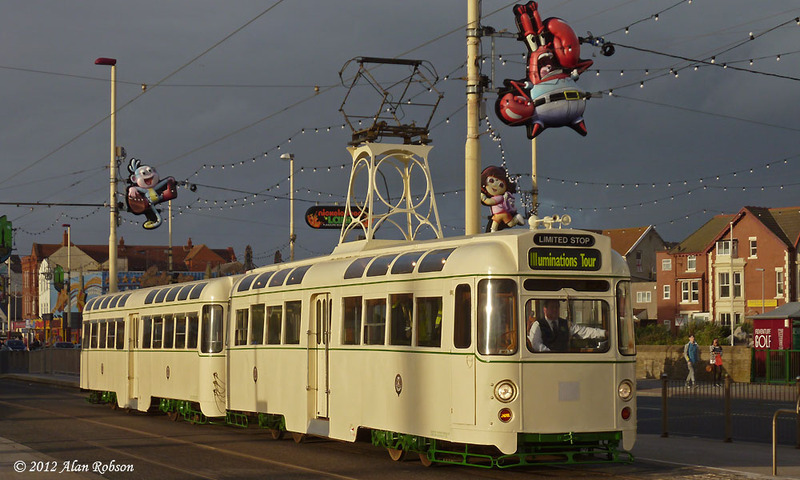 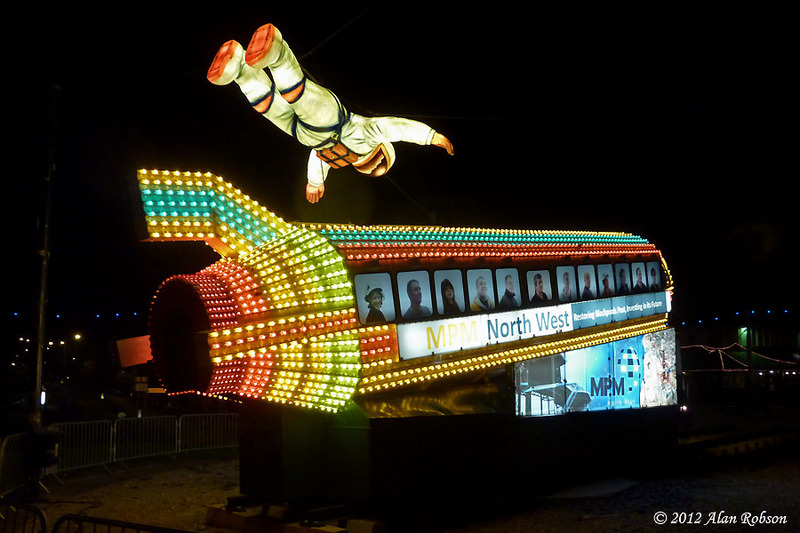 The Rocket has received sponsorship adverts on both sides of the tram now. 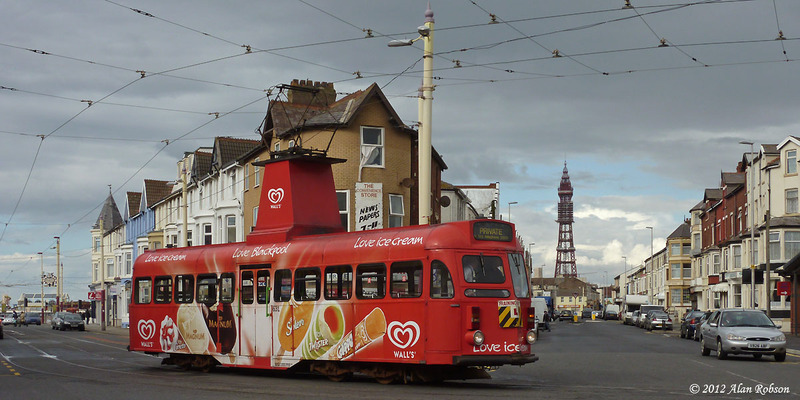 The seaward side carries adverts for MPM North West (the company involved with repairing and repainting Blackpool Tower), while the opposite side of the tram has advertising for FTS (no, not the Fylde Tramway Society, but Future Technology Services, an electrical contract company based on Brinwell Road). 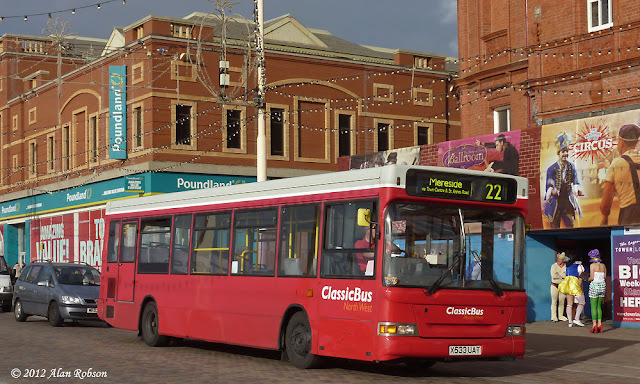 Classic Bus North West began running their new "Catch 22" town bus service yesterday which runs between Mereside and Cleveleys, operating on a 30 minute headway. For route details see http://www.traveline-northwest.co.uk/timetableplanner/toggleMainStops.do?hss=Bajwf50059618. 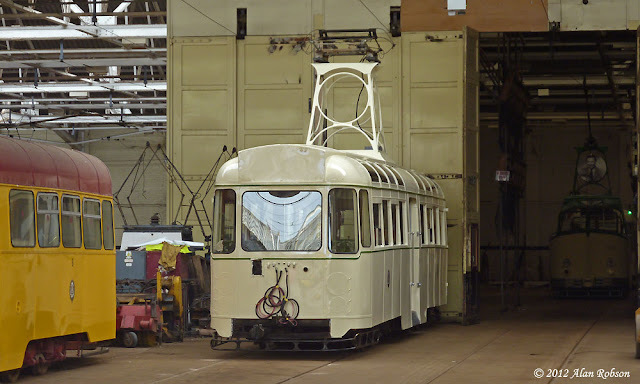 Further to the photos published of heritage Twin Set trailer 682 during its shunt last week, here are a couple more views taken on the same day that show motor car 672 in its all cream paint scheme. Red Dennis Darts have been noted operating on the Seafront 12 service this week. 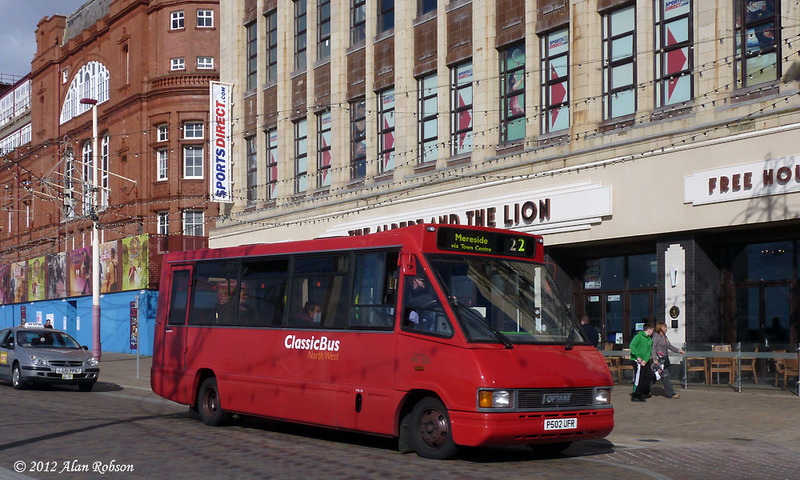 X512 UAT and X533 UAT were acquired from Transdev in London by Classic Bus North West, along with several other buses for use on their upcoming "Catch 22" service. The new Catch 22 route starts running on Monday 10th September, and will operate between Mereside and Cleveleys via Blackpool. 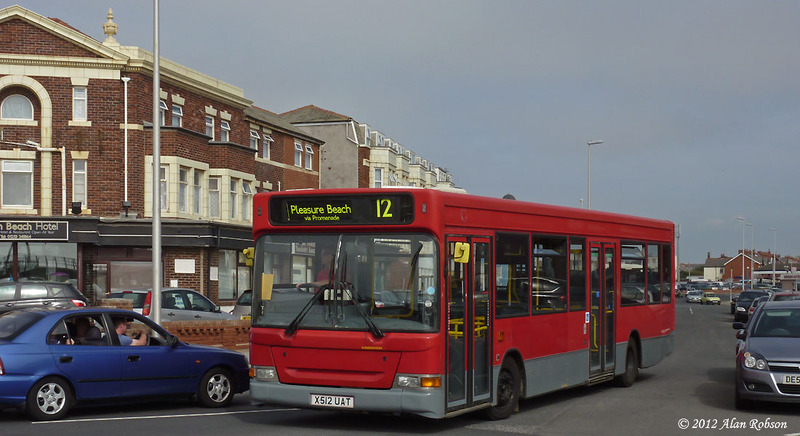 The Darts are being used on the Seafront 12 service to aid driver familiarisation of the new vehicle type. 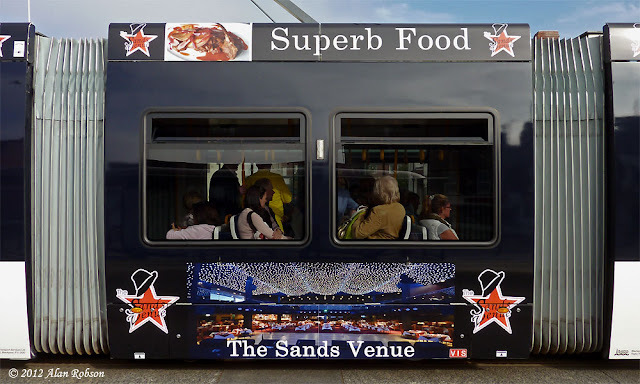 001 has become the latest Flexity to carry advertising, receiving new adverts for The Sands Venue, which is located in the former Palace nightclub building near to the Tower. This is the first Flexity to have a new advert applied since July. Balloon 719 was moved from the fitting shop to the paint shop via the bus yard at Rigby Road depot this morning, hauled by Unimog 938. Balloon 719 has now been fitted with the widened framework and fairings (porches) for the new plug doors, and has been transferred to the paint shop to receive a new colour scheme. 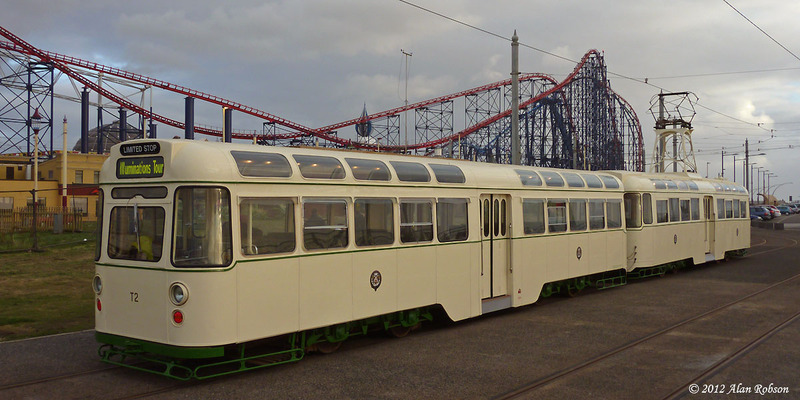 Hopefully a brighter paint scheme will be chosen this time, rather than the dismal black based advert livery that it currently carries. The last of the LTT fleet of preserved Blackpool trams has safely left Rigby Road depot for pastures new. 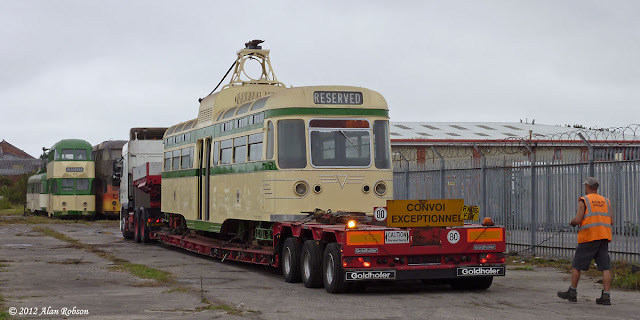 On the morning of 7th September, Coronation 304 was towed out of the depot by Unimog 938 at 09:30 and moved into Blundell Street for loading onto the impressive low-loader rig of Allelys Heavy Haulage. 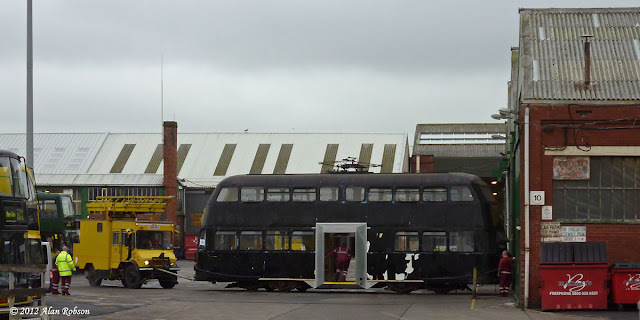 By 11:05 the low-loader was parked up on the site of the old Duple coach factory in Marton ready to unload its precious cargo, thus bringing to an end the long running saga between BTS and the LTT. 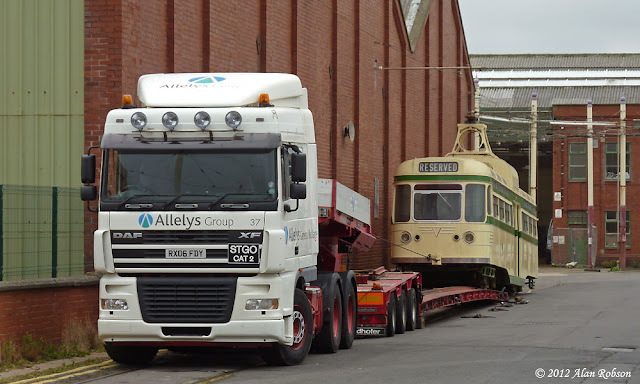 These four days of tram moves have demonstrated what a professional and efficient company Allelys are at moving rail vehicles. The future prospects of the LTT tram fleet look a lot more secure now, and it is to be hoped that most if not all of the trams that have been moved to outside storage can at some point find a more permanent home, preferably under cover, as some of them, notably 259 and 704, will deteriorate very rapidly if the exposed woodwork is subjected to prolonged exposure to damp conditions. 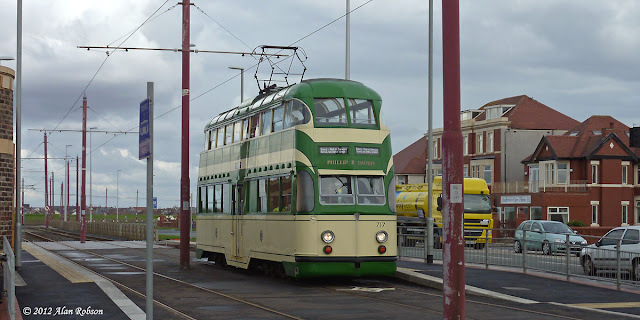 For a while now it had been intended that Twin Set 672/682 would join the heritage fleet at Blackpool, and that it would be repainted in an older style of livery, but exactly which livery had so far been kept secret up until today. 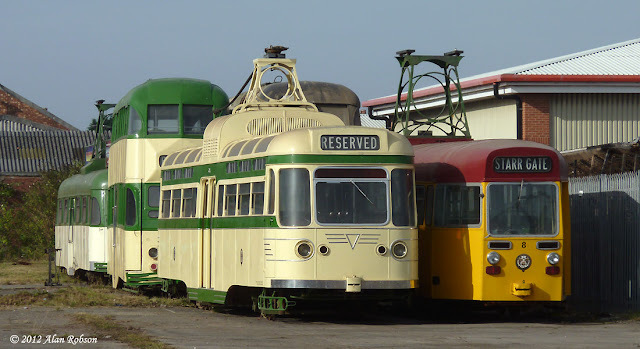 Separate shunts of the two halves of the Twin Set brought it out into the open today, revealing that the chosen colour scheme is the short lived all cream livery from the early 1960s. 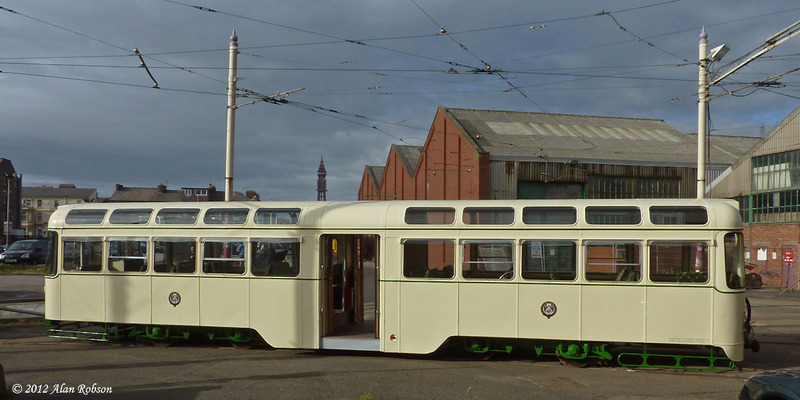 Trailer car 682 was very briefly shunted out of the depot just after 17:00 this evening, and it looked resplendent in its new all cream livery, complete with green lining and Blackpool Corporation crests. 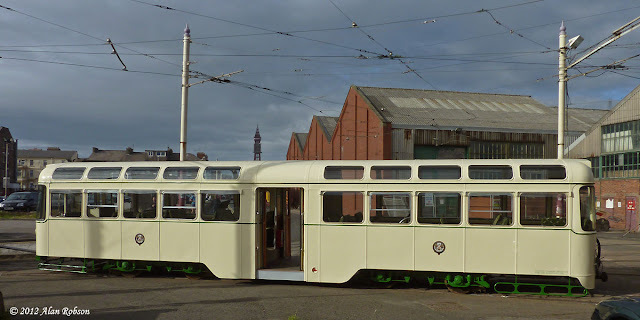 It was suspected that the shunt was to bring the two halves of the Twin Set together, so hopefully we will see this superb looking Twin Car in use again in the not too distant future. The 6th September saw a day of hectic tram movements for Allelys Heavy Haulage. 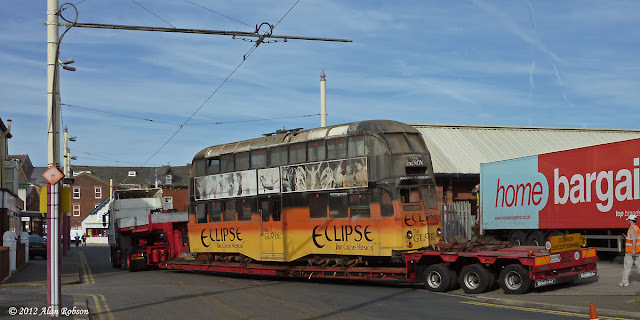 Beginning at 08:30 and ending round about 19:00, three Blackpool trams belonging to the Lancastrian Transport Trust were moved from Rigby Road depot to an outdoor storage yard in Marton. The first to depart was Balloon 704, which has been used as a spares tram for BTS since it was withdrawn in 2003, the next tram to follow was Ballooon 715 which had seen much use in Blackpool in recent years, finally OMO 8 joined the other LTT trams at the old Duple factory site, arriving just after 18:00.